A "red momentum" of popularity for Chilean cherries continue to strengthen as increasing quantities of these cherries arrive in China. The price of Chilean cherries has been also trending high recently, with some varieties in particular continually rising in price. As economic growth slows down in China, how are high-priced fruit such as Chilean cherries still able to maintain and even grow in popularity? George Liu, CEO of Fruta Cloud, one of the importers of Chilean cherries, thinks the main reason for this lies in the fruit itself. "This season’s Chilean cherries are larger than average and are of particularly high quality, and as a result, we have received quite positive feedback from consumers. 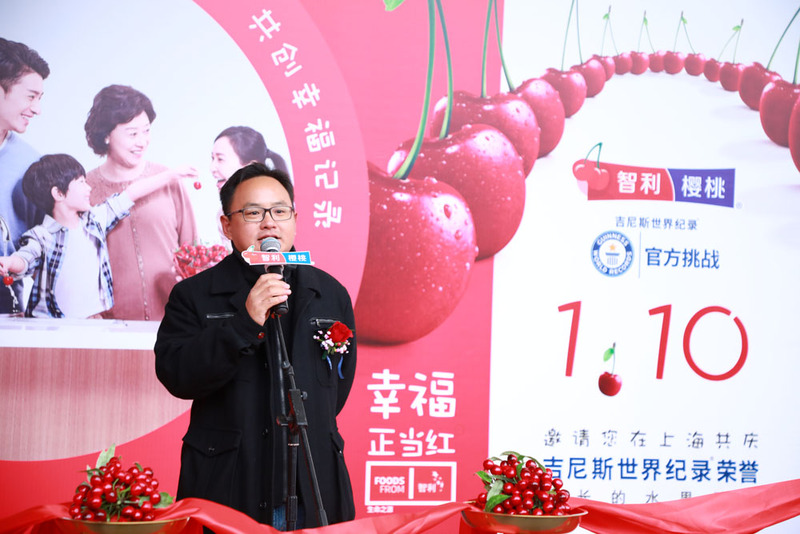 On January 4, a market launch event for Chilean cherries was held in Chongqing in Southwest China, signifying that there's still much untapped market potential in second- and third-tier cities in China." Mr. Owen Ou, General Manager of Shanghai Riverking Co., another major importer, attributed the good sales performance to the intersection of several positive factors. "My personal view is that the quality of fruit this season has been the best I have ever seen for Chilean cherries, which has led to repeat purchases by consumers. Various retail channels in China also expanded their promotional efforts for Chilean cherries this year, which certainly helped. Furthermore, a large portion of Chilean cherries exported to China this season was routed directly to retailers and secondary wholesalers, which relieved pressure on primary wholesalers to ramp up sales and caused the wholesale price of Chilean cherries to remain high." 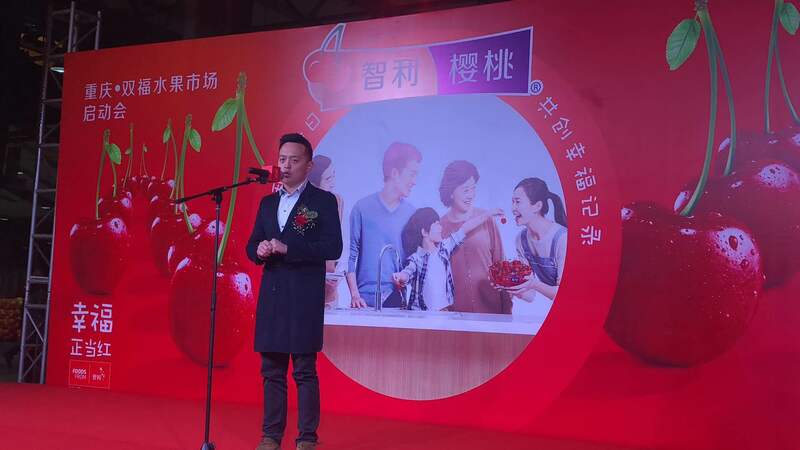 Mr. Kurt Huang, General Manager of Shanghai Oheng Import and Export Company, remarked that the frequency of shipments this season, 2-3 ocean shipments of Chilean cherries arriving in China per week, helped preserve fruit quality and improve sales. Smaller, yet more frequent, shipments dramatically cut loading times for Chilean cherries, resulting in a superior taste and continuous supply of fresher cherries. The growing prevalence of Chilean cherries in China is also inseparable from the contributions made by the Chilean Cherry Committee of the Chilean Fruit Exporters Association (ASOEX). In late December 2018, two fruitful promotional activities were hosted by ASOEX at Guangzhou's Jiangnan Fruit & Vegetable Wholesale Market and Zhejiang's Jiaxing Fruit Market. 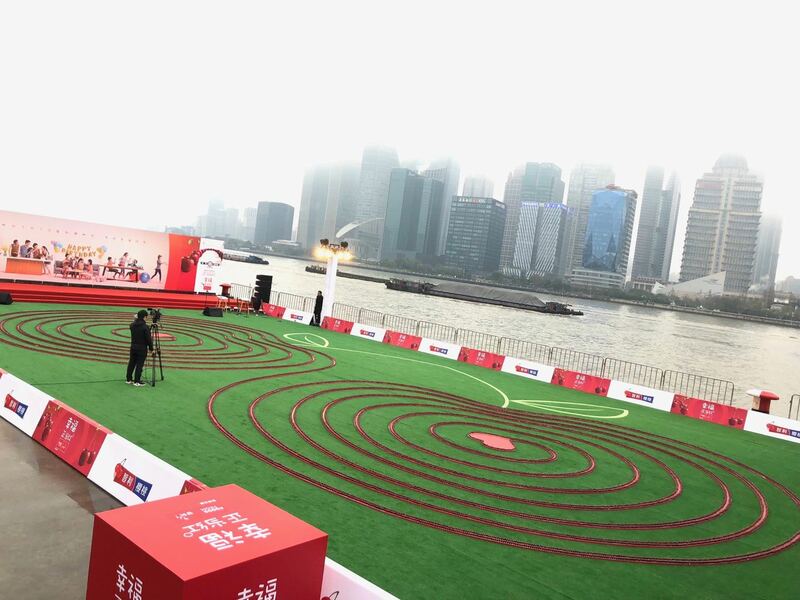 And on January 10, 2019, Chilean cherries made history and broke the Guinness World Record™ for the world's longest line of fruit: 24,638 individual cherries were used to construct a giant image of two cherries at the Shanghai Port International Cruise Terminal. ▲Chilean cherries make history by setting a Guinness World Record for world's longest line of fruit. ASOEX and its Chilean Cherry Committee won the Marketing Campaign of the Year award at Asia Fruit Logistica 2018 in Hong Kong for their impressive campaign to promote Chilean cherries in China during the 2017/18 season. 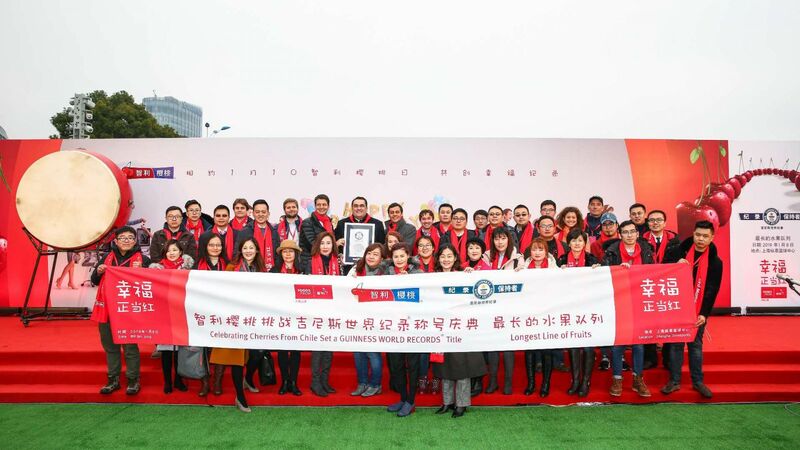 Together with ASOEX, the committee has opened its first China office in Shanghai this season with the main goals of continuing implementation of their promotional campaign, strengthening ties with key stakeholders in the market, and expanding the presence of Chilean cherries in China.